Should You Buy Intel (INTC) Stock Ahead of the Chip Giant's Q4 Earnings? Chip giant Intel INTC is coming off a strong third quarter and its Q4 outlook appears solid ahead of next Thursday’s earnings release. Despite INTC’s recent climb, along with giants like Amazon AMZN and Google GOOGL, shares of Intel still sit solidly below their 52-week high. Intel’s Q3 revenues surged 19% and topped expectations. The firm’s Internet of Things and Mobileye autonomous vehicle unit, which are two of its most buzz-worthy and potentially massive growth segments, both achieved record revenue last quarter. The company also saw its adjusted quarterly earnings soar 39%. Maybe more importantly, Intel raised its Q4 earnings and revenue guidance. The world’s largest semiconductor manufacturer is poised to grow as the digitization of the world continues at a rapid pace. As we mentioned, Intel stands to benefit from the expansion of the self-driving car industry, along with the cloud computing market, IoT, artificial intelligence, and more. Plus, the firm’s wide range of product offerings should help it amid the current trade war worries. Let’s also not forget that Intel announced in November a $15 billion increase to its stock repurchase program. 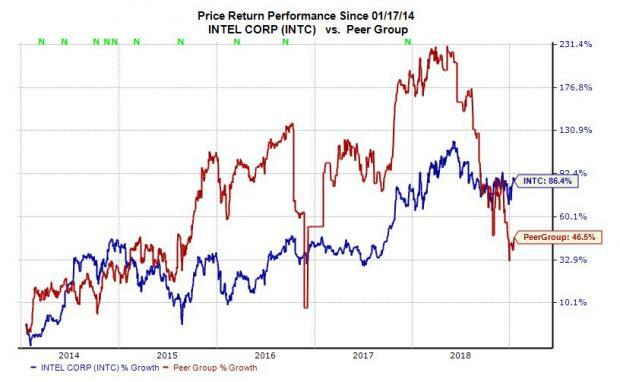 This likely signals that Intel executives believe INTC stock is undervalued. And it helps create more value for shareholders as the relative ownership stake of each investor increases. Intel has delayed the launch of its next-generation chips, which has helped some of its rivals, including firms like Advanced Micro Devices AMD, fill the void. With that said, interim CEO Robert Swan have said the firm is on track for its 10-nanometer-based systems to roll out by the 2019 holiday season. Moving on, Intel is currently trading at 10.6X forward 12-month Zacks Consensus EPS estimates. 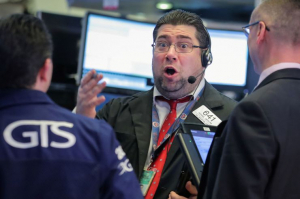 This marks a discount compared its industry’s 13.4X average and the S&P’s 15.8X. Nvidia NVDA rests at 23.5X and Texas Instruments TXN sits at 17.6X at the moment. Clearly, INTC’s valuation picture appears strong compared to the market and some of its largest peers, and we haven’t even gotten to the best part. Intel currently sits just above its five-year low of 9.6X and well below both its five-year high of 16.4X and its 13.2X median. Therefore, we can say that Intel stock looks pretty attractive at the moment in terms of valuation. Looking ahead, our current Zacks Consensus Estimate calls for Intel’s Q4 revenues to climb 11.5% to reach $19.01 billion. Plus, the chipmaker’s full-year revenues are expected to surge 13.5% to $71.2 billion. At the bottom end of the income statement, Intel’s adjusted Q4 earnings are projected to pop nearly 13% to touch $1.22 per share. More impressively, INTC’s adjusted full-year earnings are expected to soar roughly 31%. Intel is a Zacks Rank #3 (Hold) at the moment that sports an “A” grade for Growth and a “B” for Value in our Style Scores system. Let’s also not forget that Intel is a dividend payer with a strong history of earnings beats. Intel stock closed regular trading Wednesday down 0.97% to $48.13 a share, which marked a roughly 16% downturn from its 52-week high of $57.60. With all that said, Intel might not be a bad stock to consider at the moment. Intel is expected to report its Q4 financial results on Thursday, January 24.